In the data platform industry, we have been working with SQL for decades. It’s a powerful language and over many years, we’ve learned to work with it’s strengths and to understand and work around it’s idiosyncrasies. 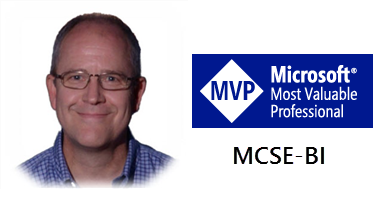 M is a considerably more modern and flexible query language. Some best practices have evolved but many are still learning the basic patterns of effective query design. Reaching that stage with a technology often takes years of trial-and-error design and a community willing to share their learnings. I will continue to share mine and appreciate so many in the community who share theirs. Why Use M Instead of SQL? For database professionals using SQL Server as the sole source of data for an SSAS or Power BI data model, there is a solid argument to be made in favor of encapsulating the query logic in database objects. DBAs need to manage access to important databases. A comment posted in an earlier post on this topic mentioned that SQL Server views can implement schema binding – which doesn’t allow a table or any other dependent object to be altered in such a way that it would break the view. This is a good design pattern that should be followed if you are the database owner, have the necessary permission and flexibility to manage database objects as part of your BI solution design. Ultimately, this is an organizational decision. If the BI solution developer is not the DBA, you may have limited options. 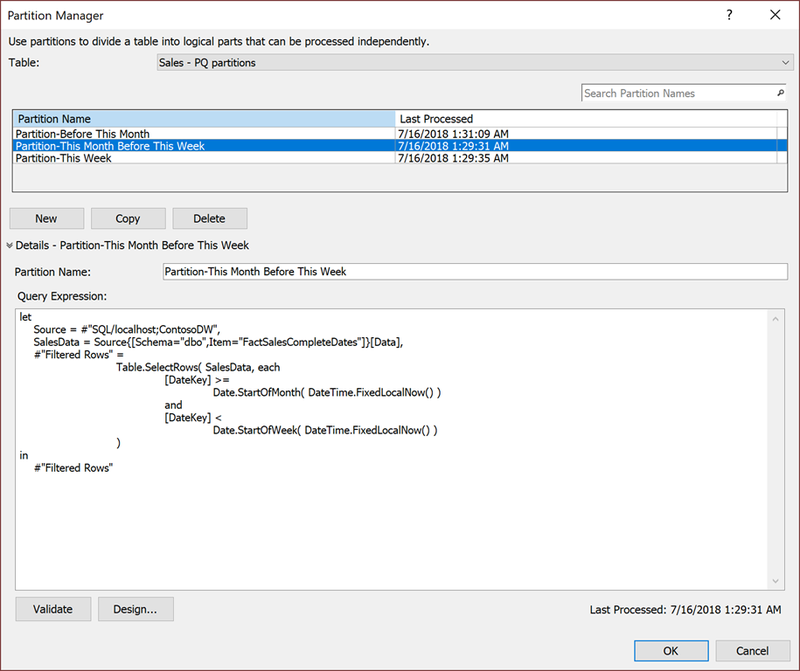 If you don’t have control over the source database objects, if you are not using SQL Server or otherwise prefer to manage everything in the SSAS or Power BI project, Power Query is probably the right place to manage all the query logic. In my earlier post, I used a table-valued user-defined function to manage the partition filtering logic in SQL Server. Rather than using SQL and database objects, we’ll use Power Query alone. The working M script is shown below. For brevity, I’m starting by showing the solution but I will show you the steps we went through to get there a bit later. The three partitions defined in the earlier example are replaced using the following M script, which returns exactly the same columns and rows as before. When connected to an enterprise data source like SQL Server, Power Query should be able to pass an important test. 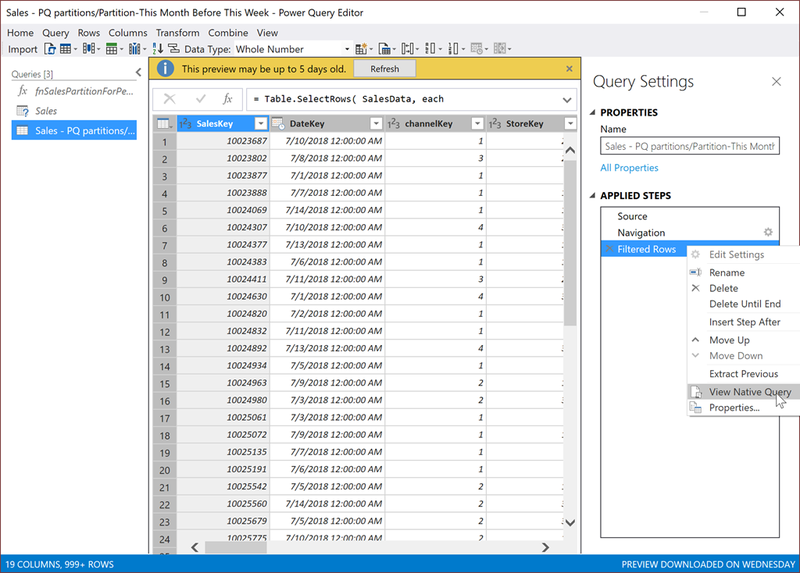 Use the Design… button to view the Power Query Editor. Select the last query step and then right-click to show the menu. You don’t need to do anything with this information. It’s just good to know. End of story. Power Query is an awesome tool that does some amazingly smart things with the simple data transformation steps you create in the designer. However, it is important to make sure Power Query produces efficient queries. During the development of this solution, I created an early prototype that didn’t produce a query that would fold into T-SQL. Thanks to Brian Grant, who is an absolute genius with Power Query and M, for figuring this out (BTW, you can visit Brian’s YouTube tutorial collection here). The rest was simple, I just added filters using these columns and then removed the custom columns from the query in the last step. All good with one small exception… it didn’t work. We learned that Power Query can’t use custom column values to build a foldable filter expression. The filters just won’t translate into a T-SQL WHERE clause. Checking the last query step with a right-click shows that the “View Native Query” menu option is grayed-out so No Folding For You! Simple lesson: When query folding doesn’t work, do something else. 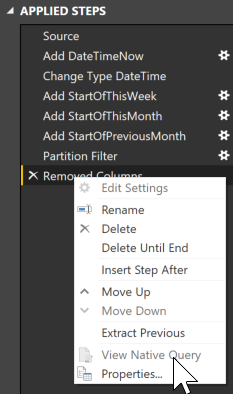 In this case, we just had to put the date comparison logic in the filter steps and not in custom columns.